On 31st Gurupoornima was celebrated.On the importance of the day Smt. Ambika delivered a speech. Students sang bhajan on Gurumahima. Flower were offered at the holy feet of the guru Vyasa by the teachers and students. 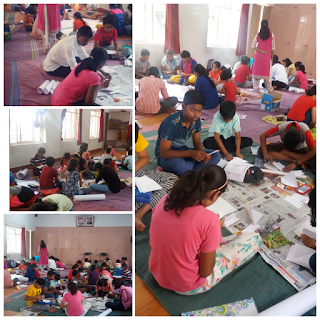 Competitions were conducted for the students from UKG -7th std on guru shlokas. On 150th August Independence Day was celebrated Sri Ravi kumar was the chief guest. He is a retired bank manager. He had worked in different banks in Bangalore and Pondichery. He unfurled the flag and took the Guard of Honour. Students did march past with bands. They received a great applause from the public. They also displayed different formations.